Draft Before Damage: 11' 7"
1. On 15 September 1942, a submarine torpedo detonated against the port side of O'BRIEN between the stem and frame 6 and about 10 feet below the waterline. The resulting local structural damage is shown in Photos 32 and 33 and Plate 17. The bow structure, below the main deck and aft to Frame 10 was blown away. Framing and plating were distorted back to frame 14. Free flooding occurred below the first platform between frames 10 and 22. As the bow plunged into sea, compartment A-202L on the first platform flooded slowly to a depth of 2 feet through ruptures in the first platform and bulkhead 14. Bulkhead 22 bulged aft but remained tight. Bulkhead 25 was not damaged. The draft forward, which was 11' 7" before damage, increased to 12' 2". This damage in itself was not serious and would not have placed the vessel in jeopardy. 2. The explosion also caused severe flexural vibration of the hull girder. Photos 34 and 35 and Plate 17 show some of the moderate buckling of hull plating and longitudinals which resulted near frames 37, 78 and 123. The most serious failures were in the bottom structure between frames 104 and 108. Wrinkling and buckling of the shell and longitudinals extended from frame 104, starboard, across the bottom to frame 108, port. In this region the vertical keel, No. 2 and 6 deep longitudinals, several smaller longitudinals and shell plating all failed to some degree. Thus, the entire bottom flange of the ship girder was seriously damaged. In this area many rivets were loosened or sheared. There was considerable leakage through rivet holes and open seams into the forward engine room. Gun roller path data indicated that the after portion of the ship was twisted 1° to port. Espiritu Santos on 16 September. The following repairs were made by 0'BRIEN, CURTISS and the 7th Construction Battalion. (a) Bulkhead 6 above the main deck, the deck of A-202L, and bulkhead 14 between the first platform and main deck were made tight by patching holes. (b) Bulkheads 6 and 14 were reinforced with concrete. (c) Bulkhead 14 and the deck of A-202L were shored. (d) Divers installed bolts and patches to plug all holes in shell plating between frames 104 and 108. Forty hours diving time was required to accomplish this. (e) Removed 150 rounds of 5" AA common and all except two 600# depth charges. (f) Stowed anchors and chains aft. 4. 0'BRIEN departed Espiritu Santos on 21 September and proceeded at a maximum speed of 11.5 knots to Noumea, a distance of 603 miles, arriving there on 23 September. During passage wind and sea did not exceed moderate intensity. During both passages 0'BRIEN rode easily. Although regular inspections were made, no working of the two parts of the ship were observed. Repairs to the bottom, which were made in Espiritu Santos, reduced leakage into the forward engine room so that it could be controlled by one fire and bilge pump; whereas, the main circulating pump, operating at near capacity, had been required to control the leakage before arrival at Espiritu Santos. (a) A partial bow section extending about half way to the waterline was installed to protect against the force of the seas during pitching. (b) At frame 37, starboard, four vertical flat bar longitudinal stiffeners were installed on the forecastle deck and two partial longitudinals were installed to reinforce the sheer strake. tear in the sheer, s trake was welded and two partial longitudinals were installed on both the port and starboard main deck stringers. Two partial longitudinals were installed on the starboard sheer strake. (1) Deep sections were 21" x 10" x 3/8" welded T's, and extended over a length of 3 frame spaces (63"). Shallow sections were 4" x 3" x 12 1/2# welded T's and covered 2 to 3 frames. These scantlings were about the same or larger than those of the longitudinal which the temporary member was to reinforce. (2) The reinforcing longitudinals were offset transversely from the damaged longitudinals they were meant to replace. The length of the new longitudinals was less than the distance between transverse web frames. (3) No replacement was made for the loss of effective area of the hull girder resulting from damaged bottom plating. (c) Five torpedoes, eight 300 lb. 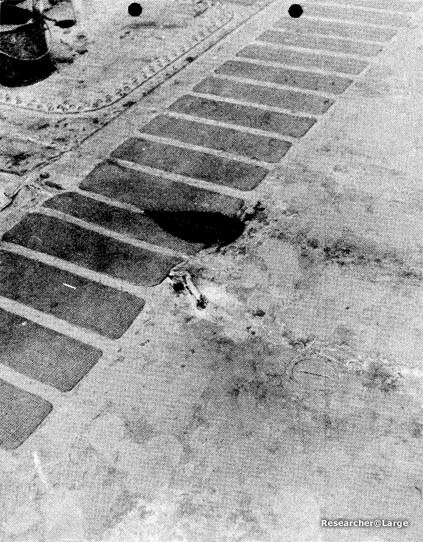 depth charges, 12,000 rounds of 20 mm ammunition, some SC radar equipment, and computer and 36" searchlight remote control spares were removed. No. 6 port longitudinal	was	found to have failed in tension. During this passage wind and sea did not exceed moderate intensity, and turns for 13 knots resulted in a ground speed of 12 knots. 7. At Suva, an angle was welded to the broken reinforcing plate. The damage and repairs throughout the ship were inspected thoroughly. No other indications of increased damage or weakening of the repairs were observed. At 1430, 16 October, 0'BRIEN joined CIMARRON and LANG in the outer harbor. When the ship reached the open sea, leakage into the forward engine room again increased to about the rate previously experienced under similar sea conditions. One fire and bilge pump, operating slowly, controlled the leakage. 8. After leaving Suva, 0'BRIEN crossed the international date line and 16 October was repeated. By early morning of 18 October, the rate of leakage had increased to the extent that one fire and bilge pump was required to control it. At 0500, 18 October, a second fire and bilge pump was started so that each might run at low speed. Inspection revealed that the reinforcement of No. 6 port longitudinal again had cracked in the same place as before. Just outboard of this longitudinal the shell plating had a 3 inch crack along a wrinkle. The rate of leakage continued to increase so that at 0900 the two fire and bilge pumps were secured and the main circulating pump was started. About 1000, the vertical keel was found to be completely broken and cracks were developing in the other deep longitudinals and in the shell plating. Course was changed to Pago Pago and to pass Upolo close aboard. 9. The ship's force undertook various precautionary measures to meet emergency conditions, including jettisoning topside weights, assembling the crew for instruction, arranging communication signals, reducing free surface in fuel tanks, etc. Throughout the remainder of the day and night, the rate of leakage into the forward engine room continued to increase, but still could be controlled by the available pumping facilities. At 0337, a shell plate on the port side behind the dynamo condenser broke with a loud noise and the water level rose slowly even after full pumping facilities were used. At 0430 it was necessary to abandon the forward engine room. At 0600 the bottom suddenly opened considerably and the forward and after portions of the hull began to work independently. At 0605 the starboard side cracked open up to the main deck. The ship was abandoned at 0630, and sank about 0800, having steamed 1027 miles from Suva and about 2800 miles after having been torpedoed. 10. Because complete details of the damage are not available, calculations of the structural condition of the ship have been made on the basis of the damage reported by the Commanding Officer. In calculating the condition of the ship after damage, it has been assumed that none of the damaged structure remained effective. Since some of the damaged structure undoubtedly remained partially effective, the actual section moduli probably are greater than indicated. In calculating the condition of the ship after repairs, it was assumed that all reinforcing members are fully effective. The variables involved in calculations of this type preclude accurate estimates, therefore, the results	should be considered as changes which might have occurred rather than precise data as to what actually occurred. They serve to present the order of magnitude of the changes in strength of the ship girder. Neutral Axis above Base 10.25 ft. 17.64 ft. 13.78 ft.
but before Flooding - - 18 tons/sq.in. and after flooding. - - 21 tons/sq.in. during this time. The hull split up to the main deck shortly after the engine room flooded to the waterline, putting the ship in an extreme sagging condition. 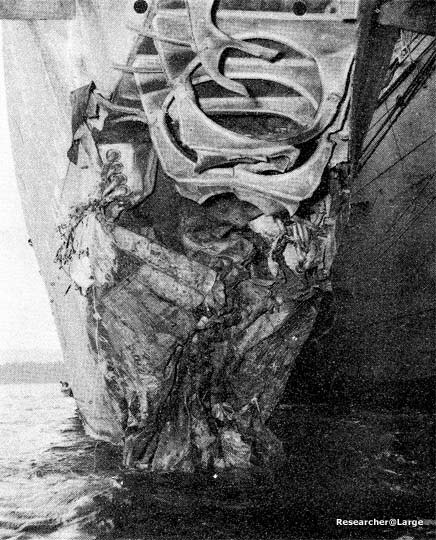 The main deck, starboard, started to rupture but did not fail completely. (a) The damaged material was not replaced adequately. 260 square inches of material was damaged in some degree and only 100 square inches was replaced. It appears that the area lost due to wrinkled bottom plating was completely neglected. Medium steel was used to replace damaged high tensile steel without compensation for the difference in strength of the two materials. (b) The replacement longitudinals were not of sufficient size and length, and were not properly located to distribute the loads properly. Since the longitudinals were only 63" long and the distance between web frames was 108", the longitudinals obviously were not long enough to convey the loading to intact structure and the ends could not have been adequately connected. The replacement longitudinals were not in line with the existing structure. This eccentric arrangement resulted in stress concentrations at the ends of both the replacement and the original longitudinals. The omission of additional plating or flanges on the lower end of the replacement longitudinals also served to increase the stress in these members. Photo 32: O'BRIEN DD415 Damage to bow from torpedo hit. Photo 33: O'BRIEN DD415 Damage to bow from torpedo hit. 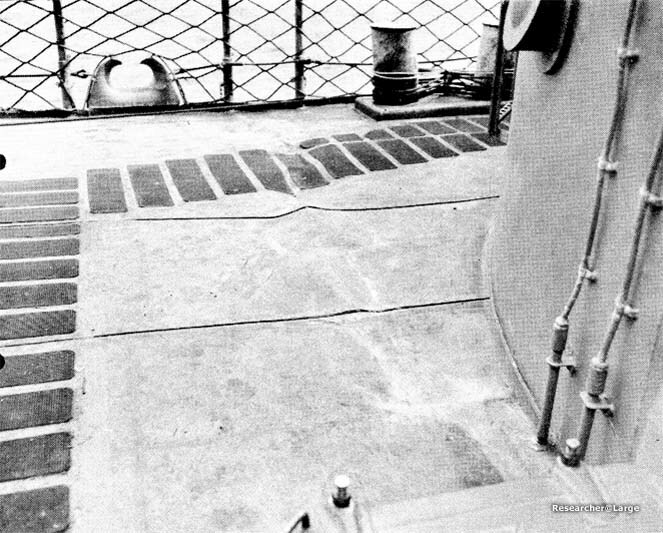 Photo 34: O'BRIEN DD415 Crack and wrinkle in main deck plating frame 78, starboard, caused by flexural vibration resulting from torpedo detonation near the bow. 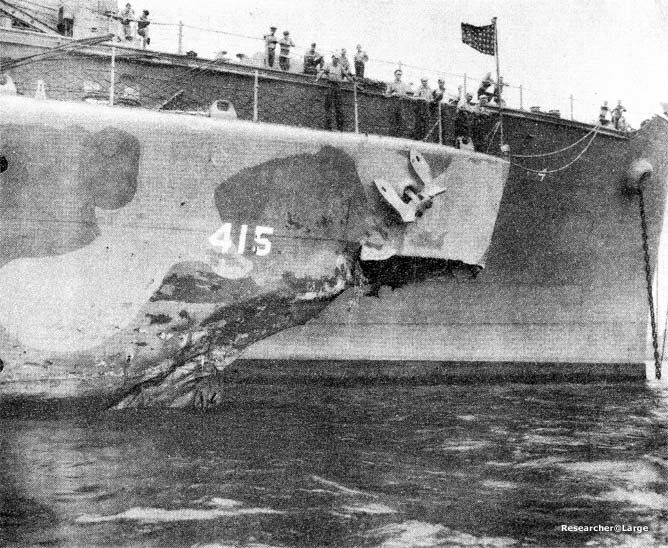 Photo 35: O'BRIEN DD415 Wrinkles in forecastle deck, frame 37, starboard, caused by flexural vibration resulting from torpedo detonation near the bow. "Structural Repairs in Forward Areas During World War II" -BuShips Booklet dated December 1949.